It’s Syracuse’s first “test” of the season. You’re going to hear that said a lot tonight, as the Orange (2-0) take on Uconn (2-0) at MSG. Tests are great. They’re supposed to show how good a team really is, something we’re all dying to know about Syracuse. We know this team is really strong on paper. All of the major contributors on a defensively suffocating sweet 16 team are back. Elijah Hughes, Jalen Carey and Buddy Boeheim are ready to add to what was already there. It sounds like a shoe-in for a successful season. But that’s just not how college basketball works. Ask a USC fan. The Trojans were ranked 10th in last year’s preseason AP Poll due to their experienced returners. They wound up going 24-12, and biting their nails on selection Sunday. They looked good on paper, but it didn’t mesh. A basketball team is like a puzzle. The pieces need to fit together. Remember when this ridiculously hyped Lakers team missed the NBA playoffs? All this to say, until Frank Howard plays, we can’t know if this team is good offensively. The senior point guard has been out with a left leg injury sustained in the fall. Last season, the Orange struggled to score in large part because they lacked a high-level distributor. Their offense was heavy on pick and roll, as Jim Boehiem’s teams always are, but the ball-handler usually looked to score off the screen. There was too much one-on-one, and not enough movement of the basketball or players off-ball. The question remains: how is that going to change this year? Frank Howard has a shooting guard’s skill set at the point guard position. Jalen Carey might not be ready yet to play major productive minutes in the ACC. Elijah Highes is another ball dominant scorer. Syracuse’s best passer, Marek Dolezaj, is bumped out of the starting lineup. And as we saw last season, Tyus Battle and Oshae Brissett are great at a lot of things, but none of those things are quarterbacking an offense. 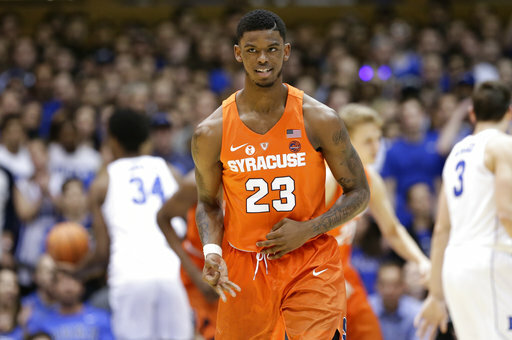 Boeheim has a major task ahead of him to try and make this offense work. This team is a lock to be a defensive juggernaut. But until proven otherwise with Frank Howard healthy, the offense is an unknown. He’ll be a game-time decision tonight against the Huskies.